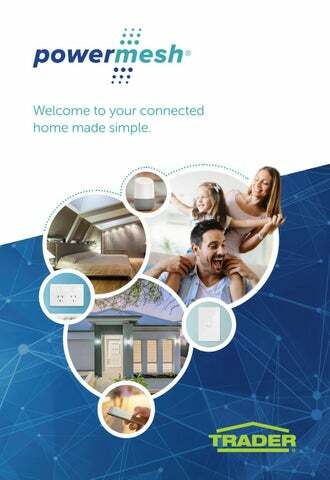 Welcome to your connected home made simple. Home automation is now an affordable luxury for everyone in every home. Get comfortable with the convenience of control. We’ve taken the complexity out of connectivity in the home, making technology simple to complement your lifestyle. You can now control what you’d like, when and how you’d like. It’s never been this simple - get connected today. 100 years of electrical innovation in the home. Our vision for the future is drawn on experience from the past. Technology should be easy to use and liberate you from complication, making life easier for the whole family. Trader continue the Gerard family tradition of providing true innovation as the leader of Australian electrical products in the home. The Gerard tradition spans back several generations to 1907 when Alfred Gerard first started his own business. Thatâ&#x20AC;&#x2122;s over 100 years of supplying quality electrical products to millions of Australians. Traderâ&#x20AC;&#x2122;s Powermesh Range Our suite of Powermesh products offer a complete home automation solution that boasts pure simplicity. With the familiarity of traditional devices and the ease of smart device and voice control, youâ&#x20AC;&#x2122;ll quickly become accustomed to the convenience. Smooth dimming for your lighting with many features activated by a simple touch.. Suitable for controlling more than lighting with inbuilt scheduling and energy use monitoring. Get your home connected with Zimi on your smart phone and tablet. Simple control right at your fingertips. Get answers, play songs, tackle your day, enjoy entertainment and control your connected home with just your voice. Easily control and monitor the energy use of your appliances with inbuilt automatic scheduling. Extend your control to anywhere in the world. Enable voice control of all your devices. Simple. Secure. Reliable. The future of connected devices use mesh networks. Powermesh enabled devices send and receive messages from each other, eliminating the need for a central hub. Each device plays a role, with more linked devices providing network reliability and a quicker response. Control at your fingertips Download Zimi for free on your phone or tablet to take control of all your Powermesh devices. Voice control with the Google Assistant Use voice commands to control Powermesh devices in your home hands-free. Just say, â&#x20AC;&#x153;Hey Googleâ&#x20AC;? to get started. Requires Zimi Cloud Connect and an Internet connection. Anywhere, Anytime with Zimi Cloud Connect Zimi Cloud Connect lets you take your home with you. Control your home anywhere in the world via the internet. Whose turn to switch off the lights ? It’s Zimi’s turn. Complete control of lighting in your hand, life just got a whole lot easier. The dimmable light switch that does so much more. Advanced technology and features within the simplicity of a wall switch. Weâ&#x20AC;&#x2122;ve made it so simple. Lighting control offers the most convenience in your home. Set the mood, light the task, increase security and save electricity. Itâ&#x20AC;&#x2122;s never been this easy. Designed to work with normal wiring in any home. Tap on and off with a single touch. Push and hold to dim up & down. Double tap to turn on full brightness. Triple tap for a timed smooth fade to off. No longer do you need to reach for the light switch. Control all of your lighting, in the palm of your hand. Dimming compatibility Suitable for use with halogen, incandescent lamps and most dimmable LED lights. Dimming can also be disabled for simple on/off control. Mini dimmer indicator Displays the brightness level of your lights, convenient when not directly in sight. Easily set the mood for outdoor entertaining. Choose a style to suit your decor Three different face plates are included to suit your home decor. Available in white or black. 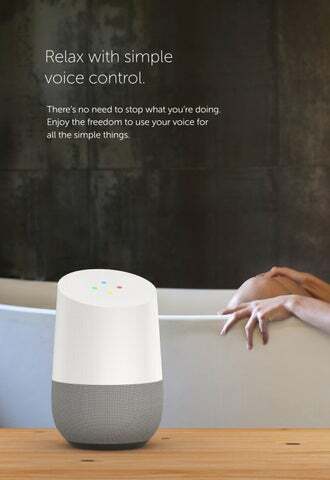 Voice control with the Google Assistant Use voice commands to control lights in your home hands-free. *Requires Zimi Cloud Connect and an Internet connection. Good Night. Fading the lights to off over time is a more natural way to end your day. Start your day with the feeling of a gentle sunrise (instead of an alarm). Light the way home. Going out or coming home? 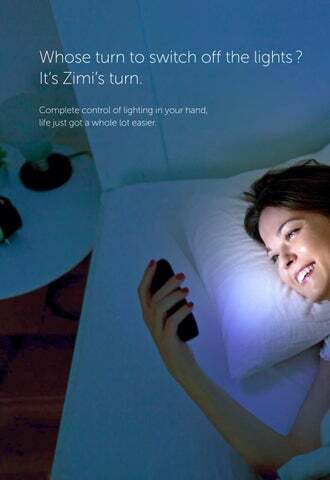 You wonâ&#x20AC;&#x2122;t be left in the dark with Zimi. Lighting at your fingertips. Relax with simple voice control. Thereâ&#x20AC;&#x2122;s no need to stop what youâ&#x20AC;&#x2122;re doing. Enjoy the freedom to use your voice for all the simple things. What will you control with your voice? Use voice commands to control Powermesh devices in your home hands-free. Just say â&#x20AC;&#x153;Hey Googleâ&#x20AC;? to get started. Take control of your Powermesh devices by simply using your voice. Zimi Cloud Connect works with the Google Assistant to control lights and appliances in your home hands-free. Hey Google What can i help you with today? Appliances Simply plug an appliance into a Powermesh Power Point and then name it using Zimi. The Google Voice Assistant can switch individual appliances off and on, or everything in a room with just one command. Lighting Not only can you turn different lights on and off, you can ask the Google Voice Assistant to dim the lights to any brightness that you like. Itâ&#x20AC;&#x2122;s perfect for bedtime or when youâ&#x20AC;&#x2122;re coming home at night. The double power point with super powers. Simple automation with powerful technology to switch, monitor and manage appliances in your home. Life just got a whole lot easier. Power monitoring Understand the power usage of individual appliances with the actual cost of electricity. Google voice assistant Just say â&#x20AC;&#x153;Hey Googleâ&#x20AC;? and you can control your appliances with hands-free convenience. Zimi app Control and manage your power point features on your phone or tablet. Automatic schedules Turn your appliances on or off automatically whenever you like. Power lock Prevent power switches from being turned on. Safety and security with peace of mind. Power Lock A simple feature that can lock power switches from accidentally being turned on. Safety and peace of mind for all the family. Lock or unlock each switch separately. Itâ&#x20AC;&#x2122;s so much more than a normal power point. Control. Manage. Monitor. Automate your appliances for safety, convenience and just because you can. Simple control Just plug in your appliance and you can switch it off and on with the Zimi app. Thatâ&#x20AC;&#x2122;s convenience right in your hand. Schedule it around the clock Turn it off in 2 hours or have a regular schedule for particular days of the week. Itâ&#x20AC;&#x2122;s so easy to automatically control your appliances whenever you like. Did you turn it off ? Don’t worry, you can easily turn off appliances when away from home. That’s the peace of mind you have with your connected home. Internet connection and Zimi Cloud Connect required to control Powermesh products when away from home. Anywhere. Anytime. Maybe the local coffee shop, the beach or even the other side of the world. Zimi Cloud Connect lets you connect and control your home via the Internet. So when you leave home, youâ&#x20AC;&#x2122;re always connected. Track your energy costs. Understanding your energy usage is the first step in saving electricity and reducing costs. Monitor your Powermesh products in real time. Compare usage Your electricity rate Enter your electricity providerâ&#x20AC;&#x2122;s rate to show real operating costs. See the live power consumption or the total used for the day. Cost vs wattage Monitor your energy usage in watts per hour or dollar cost. Lighting & Appliances Track the usage of all your Powermesh products in each room of your home. Total summary Quickly see the total power cost or usage of everything together. Suits your existing home, new home, in fact ... any old home. Simply swap them over. Installed in minutes. Simply replace your existing light switches and power points with Powermesh. We’ve made it so quick to get connected. 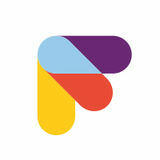 The scalable solution for you. A single room or your whole home? Simply start with a few devices to suit your budget and lifestyle. It’s easy to add more later! Out with the old, in with the new. Simply replace your existing products in any home, using the same wiring. We’ve made the technology easy to adopt in any home. Any licensed electrician can install. No special wiring or equipment required. Contact your local electrician or visit www.zimi.life to search for one now. Family Friendly Zimi supports multiple users with privilege control, making it easy for the whole family to use. Regardless of age, thereâ&#x20AC;&#x2122;s benefits for everyone. Trader Powermesh products must be installed by a qualified electrician. Zimi requires a compatible (Android, iOS) mobile device. Availability and performance of certain features are service, device and network-dependent and may not be available in all areas; subscription(s) may be required, and additional terms, conditions and/or charges may apply. All features, functionality and other product specifications are subject to change without notice or obligation. Powermesh products are optimised for the use with the Zimi App. The Bluetooth word mark and logos are registered trademarks owned by the Bluetooth SIG, Inc. The Trader logo is a registered trademark of GSM Electrical (Australia) Pty. Ltd. IOS is a trademark or registered trademark of Cisco Inc. Zimi and Powermesh and their respective logos are registered trademarks of GSM Innovations Pty Ltd. Google Play and the Google Play logo are trademarks of Google Inc. Google Home requires Wi-Fi, Google account and compatible device. Google, Google Home, Google Home Mini and Google Home Max are trademarks of Google LLC. Apple, the Apple logo, Apple Watch and iPhone are trademarks of Apple Inc., registered in the U.S. and other countries. App Store is a service mark of Apple Inc., registered in the U.S. and other countries. © Copyright 2018 GSM Electrical (Australia) Pty. Ltd. All rights reserved. Trader Powermesh products work with the Zimi home automation ecosystem. Make your life easier, get connected today. Relax with simple voice control of your lighting. Powermesh light dimmers and your Google home work together. Its bedtime, your just nodding off to sleep, and then you remember those downstairs lights you left on. Well with Zimi on your smartphone, one button can turn off all the lights in the house. You get to stay in bed. Perfect.